I owe my life to the inventor of the Keurig. If you drink coffee, and don't own a Keurig, it's time to make that purchase. Keurigs are simply amazing. They save time, don't make a mess, and they make a cup of coffee in under 20 seconds. This machine has been a life saver for me. It's so nice to be able to run out of the house in the morning and make a quick cup of coffee on the way without having to clean up the coffee machine after. 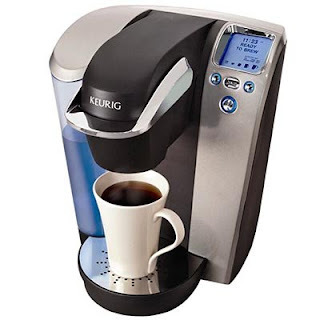 Investing in a Keurig will not only save you time, but it will save you money as well. A Box of 24 K-Cups costs about $12, that means only $0.50 per cup of coffee! I personally own 2 Keurig Platinum edition brewers (yes I said 2- one at my desk at work, and one at home) and use them daily. I like the platinum edition because you have 5 options to choose from when selecting what size coffee to brew, and you can also select what temperature to brew at. Special Edition Brewers are nice too, they don't have all of the features of the Platinum version, but are still amazing. If you're not a coffee drinker, you can still benefit from a Keurig, as there are many different varietys of K-cups (Tea, Hot Coco, Apple Cider etc.). Stay tuned for a post featuring some of my favorite K-Cups! *GREAT GIFT: If you have a coffee lover in your life that doesn't own a Keurig, congratulations, this will be the best gift you ever give.